... or at least it will be in about five minutes. I'm sitting here late on a Thursday night, probably should be in the shower and getting ready for bed, but instead I'm contemplating another hour of writing on various sites and playing a little Batman: Arkham Asylum. All of it is work in one form or another and I'm really looking forward to a short vacation we're taking late next week. I feel like I've been working nonstop since May and I need a break because I know things are just gonna get busier for the rest of the year. Anyhoo, enough of my whining. I wouldn't be doing all this stuff if I didn't enjoy it. Nothing could keep me up this late that I didn't want to be doing (besides changing diapers and dealing with a crying kid who wants her to know why her Elmo is on the wrong side of the crib). On Sunday, I had a fairly big story run in the paper that I've neglected to mention here. It was a back-to-school tech gift guide. I do these every year now and I always forget, about three weeks before deadline, how much work they actually entail. They're very easy to write, but very, very difficult and time-consuming to research and put together into a cohesive package. It involves lots of e-mails back and forth with PR people to get the right information, pricing and high-res photos. I had to round up products for the package (which involved a fun, but obligatory trip to the Apple Store). 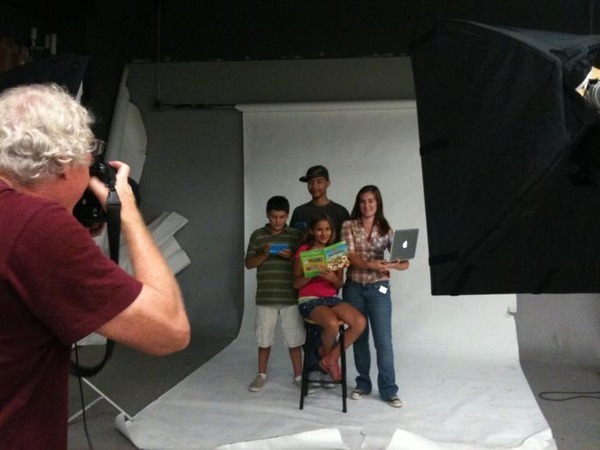 This year I added the challenge of a photo shoot with real-life kids as models for the article. The kids in the photo (above) were absolutely fantastic; they all perform with a local acting school and could not have been friendlier or more professional. But coordinating the schedules of four different people (which I did on a separate story that runs this Saturday) is one of the things that stresses me out the most. I just assume that someone won't show up. When they all do, I'm filled with a gratitude that is probably disproportionate for people doing exactly that they said they would do in the first place. On Monday, I did an NPR segment about photo scanning and storage (and a blog entry with more resources). I think we gave a very good, quick overview, but the frustrating thing is always opening up such a huge can of worms like that and then only having two or three minutes to try to mention all the things you can do, as well as sites and services that are out there. The comment pages for stories like this always turn into, "But MY company does THIS" and "Why didn't you mention..." Dudes, believe me, if I had 15 minutes, I'd have included plenty of those things. There's more to talk about, but I have to move on to the next writing thing. More time, please!